Wild Turkeys have made an incredible come back. Not that long ago, all the wild turkeys were believed to have been wiped out from the DC region. By 1910, very few remained in the woods of Maryland and Virginia, and certainly none in DC. Thanks to great restoration efforts by game commissions and hunting groups, Wild Turkeys were re-introduced into their former ranges, including into Maryland and Virginia. The first efforts using game farm birds in 1929 in Virginia failed miserably, but netting and capturing wild stock worked. 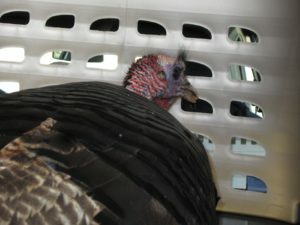 Starting in 1955 up to 1993, about 900 wild caught turkeys were released into the wilder parts of Virginia. Now they are once again part of our landscape, and getting more common each year. That landscape does not need to be that wild either. They are found in even suburban areas such as Arlington and Fairfax. The photo below shows two wild turkey hens in my driveway near Kingstowne in Alexandria for example, far from a wild place! Read more at the Capital Naturalist Blog.